Evan Rieth is a junior from Three Oaks, Michigan, studying English and environmental studies. He was voted best dressed by his high school English teacher, and most likely to travel the world by his sixth grade class. Twelve-year-olds seem to have a knack for foreshadowing, as he is now finishing up four months spent studying food in Italy, and elsewhere in Europe. In his free time, Evan enjoys breakfast and splitting firewood; you are invited to join him for both. Before I left for Europe, I was told in one of Albion’s study abroad meetings that I should do my best not to fall in love while abroad. I’m of the opinion that we don’t always get a choice on whether or not we want to fall in love, and so it was that my heart was given over to Bourdin. Her warmth, vitality and beauty could be seen from across the room, even amidst the cluster of people who were gathered around her, and who surely each had an eye on her. Bourdin (or to be more precise: Bourdin aux Pommes) is the typical apple pie of the Normandy region of France. Much like the other foods of Normandy, it is composed rather simply, consisting only of Calville apples, white sugar, and a crust made of butter (it is France, after all), salt, flax seeds and whole grain flour. Despite (or perhaps because of) its simplicity, this pie has an excellent flavor, and even in the absence of the spices American pies tend to include (cinnamon, ginger, nutmeg) the Bourdin bears more similarity than difference to its American counterpart. Perhaps this similarity is the reason I had a hard time keeping myself from eating a definitively un-French-like helping. I, like many others, come from a family with a lusty love affair with apple pies. In our house, an apple pie rarely lasts more than 24 hours from the first fateful incision into the buttery crust, until the very last glob of fruit is licked up. Like a moth to a flame, I am drawn to apple pies by forces not entirely under my control — namely the smell of a baking butter crust, and the taste of cinnamon and sugar. It could be the case that my weakness for apple pie (and especially Bourdin) is why I recently took a trip to the cider and cheese-producing region of Normandy, France, where I stayed with a 10th generation French farmer, Pierre, and his daughter, Charlie. This particular Bourdin (it would turn out to not be the only one I consumed on this trip) was made by a woman named Faustine. 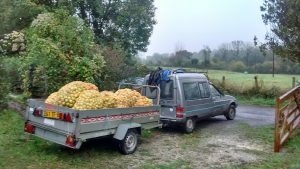 I had met Faustine just a few days earlier when I had helped her and her husband, Victor, in their annual harvest of apples for that year’s cider supply. I didn’t speak much French, and she didn’t speak much English, so there was little conversation between us for most of the day. The majority of our communication was through smiles, hand motions and my half-hearted attempts at repeating the French words she would try to teach me. And so we worked in silence. We filled large plastic mesh sacks with five different of the more than 750 varieties of apples that Normandy lays claim to. There were brown Russets that looked more like potatoes than apples, and small, red bitter things that looked and tasted like crabapples. Heading to the cider press, I was in Pierre’s car behind Victor and Faustine’s C15, making sure no errant bag of apples fell off the trailer and into the road; we stopped twice to refill the back left tire and re-affix the license plate that dangled by baler’s twine from the rear-end. 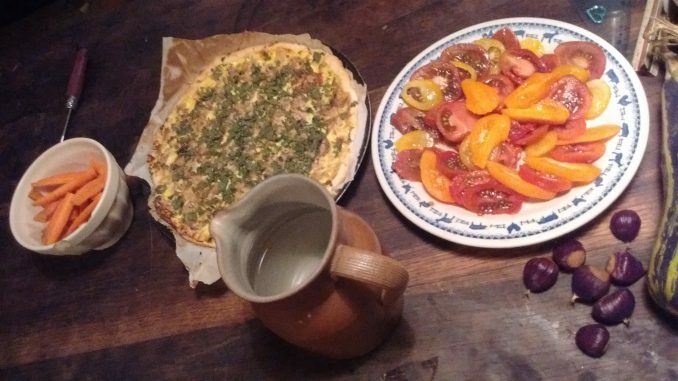 It could be the case that automotive maintenance was the reason that Victor and Faustine showed up a little late to the potluck Pierre hosted at his farm. Not that anybody noticed; we were wholly occupied by standing around a fire, and watching steaks and sausages sizzle and spit on the homemade grates. If you were to ask a scientist or sociologist why it is that people tend to gather around a fire with grilling meat, you’d likely get a response citing our DNA coding for an inherent need of protein, heat and light. But after my short time on this earth, I’ve come to believe there’s another reason as well. At its core, the power of such an environment is that it is an outstanding platform for social connection. Gathered around this source of protein, heat and light, we feel the security to express ourselves in ways we otherwise wouldn’t. In this manner — standing around a fire with grilling meat — I was able to share a space with people I had known for less than a week and feel totally comfortable with them, despite the vast differences we had. Your face lit up only by the occasional errant flame, you can talk, or not, in pseudo-anonymity, the center of attention being the fire and the food, rather than the people around it. The reason for this is fairly simple: unless you want a burned behind or a singed coat the fire will remain at the center. It seems that fire and the smell of roasting meat has a way of bringing people together in a way that social media might not be able to. Around the fire, we talked about hunting, fishing and the pace of the seasons in our lives. We showed each other pictures of the fish we’ve caught, the size of the fish often growing as the amount of wine decreased. We compared the crops we grew, the courgettes (squash) and Pommes de Terre (literally apple of the earth, but known to us as potatoes) varieties that we favored, how we grew them and our preferred method of preparation to transform a raw product into something worth bragging about, be ye Midwesterner or Frenchman. 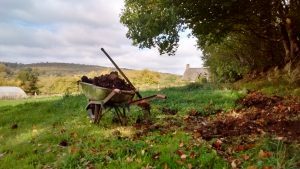 In this conversation, one of the most surprising things to learn was how much of my venerated, place-based tradition, knowledge and experience could be translated, with a little bit of work, into the place-based knowledge of this region of Normandy. It’s a strange thing to realize a place and people ostensibly so different from my own could have so much in common. Some of the crap (literally) that I shoveled. Ramps (Allium tricoccum), the wild leeks that grow in the sunlit patches of the virgin forest near my home, have their siblings in Normandy in the form of the the Ail des ours (Allium ursinum, latin for “bear’s garlic.”) Just like me, my French counterparts make their foray into the woodlands each spring to harvest these scallion-like tubers to transform them into pistou, salads and other culinary creations that result in bad breath but good health. I didn’t know what eau de vie was, but I had a creeping suspicion that it was as likely to be water as it is as likely for me to ever play power-forward for the NBA. Victor, with whom I had helped make cider a few days prior, called out across the fire, “Evan, what do you call ze liquor zat is homemade?” At first I wasn’t quite sure what it was that he was asking; many of the French make their own wine or hard cider, and the translation of the names for these drinks to English was pretty straightforward. “Moonshine,” I eventually said, the distinctively American words sounding out-of-place and foreign, my Midwestern accent making the syllables ring out like a brass bell struck within one of the Gothic cathedrals around here. My friends around the table didn’t seem to notice, however, the “life” of the drink having apparently done its job. Victor, and Pierre, sitting next to each other, lifted up their glasses, and in a rather excellent impersonation of my Midwestern accent, declared “Moonshine,” clinked their glasses and downed the remaining contents. Eau de vie, like the moonshine so infamous to the states, is a fermented, double-distilled, and non-aged liquor that is usually made on the homestead, much like moonshine. The main difference between moonshine and eau de vie, is its constituting ingredients: while corn was and is the main ingredient used in the manufacture of moonshine, it is the seasonal fruits of Normandy, in this case yellow plums (delightfully named mirabelles), that are mashed, fermented and distilled; it pairs excellently with campfire smoke. As I prepare to head home from my four months abroad, I’m struck with a sense of irony at what I accomplished during this time. I saw the sights, ate the gelato, went to the festivals, did everything I thought would result in expanding my understanding of the complexity and plurality of what makes up our common humanity. But oddly enough, it was the situation most similar to the one I am used to — standing around a fire with grilled meat — that allowed for me to learn the most about a foreign culture. Everybody is indeed looking for something. For me, it took four months of international travel, a few hundred shots of espresso, a French apple pie and some life water to realize that that something could be as simple as a group of people standing around a fire, grilling a few steaks. This is the best kind of travel writing. Funny, revealing and takes you right there. I can small that campfire. Awesome. Evan, this is AMAZING! A Storyline talk in here for sure, if you are ever interested!?!? What a thoroughly enjoyable read this was! Excellently written, your brilliant descriptions had my imagination almost seeing, smelling and tasting your experiences. What more could a reader ask? Congratulations, Evan. You’re a writer who could make a great living at it, while giving your readers meaningful, well-spent hours of enjoyment. I look forward to reading more from you!